Some things will be different to usual for a while. If you’re a regular you may have noticed the lack of posting as of late. Don’t worry – I haven’t stopped making! In fact I can share that having a creative outlet has been particularly helpful to getting me through this last year. 2016 was a difficult year – mostly because of a variety of struggles all occurring back to back. Some of you may remember I had surgical removal of my wisdom teeth (2 operations). Well I was subsequently in 2 separate car accidents – neither too serious but the first one wrote off my car, and the other resulted in whiplash related injuries to myself (hit from behind by a transit van on the motorway) and lengthy repairs to the new car. Whilst gums and backs can heal, and cars can be repaired or replaced, the loss of family members is much more difficult to adjust to. In the last part of the year my Nana passed away. While I feel glad that she is now free from the pain of osteoporosis, she is terribly missed by my whole family. Amongst other things, she was a wonderful painter, knitter, crochet-er, home decorator and story teller. I definitely owe some of my creativity and inspiration to her! My Nana and Grandad have moved house 15 times during their life together. They have always done very well out of property because my Grandad is a businessman and my Nana had creative flair and always presented their houses like something out of Beautiful Homes magazine. So it feels odd to now be looking around houses ourselves for our next house move, without my Nana at the end of the phone for advice! However, because of the work and emotional investment I’m anticipating being involved in the move, I have realised that it just won’t be practical to try and keep posting here for a period. So it is my intention to “maintain” the site – replying to comments and queries on patterns as usual – here and on Ravelry – but no new content, probably until 2018. It may be that we move to a house which needs a reasonable amount of work (this makes me quite excited – all the creative possibilities)! So it is possible you may see some before and after home décor posts here in the future – do let me know if this would interest you in the comments. In the meantime, I hope you all keep crafting and have a great 2017 yourselves! Praying for you and all your move. Looking for ward to new posts next year.Love your creations! Good luck with your house hunting and moving. Beautiful ring. 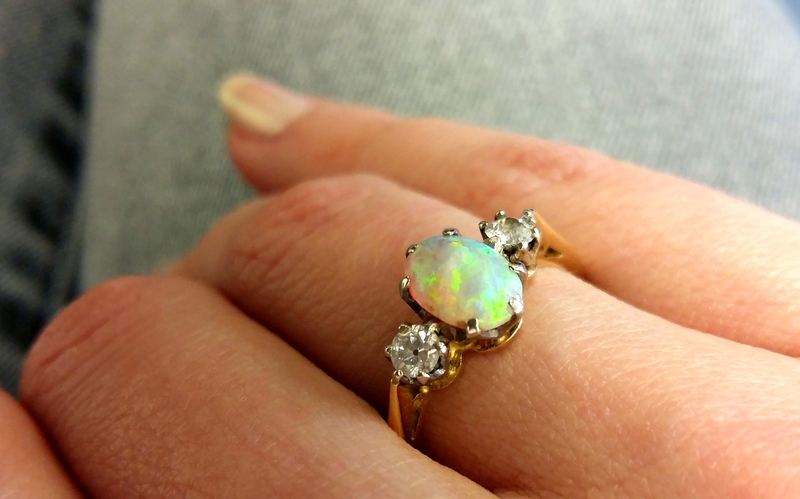 I love opals and inherited an opal ring myself! from my aunt. I’m very sorry for your loss; I understand your conflicting feelings. I would love to see before and after pics of your new house when you buy one. I am so sorry for your loss. It is obvious this is a deep loss in your life. Keep your wonderful memories. Sorry for your loss, regards from Loredana. Best of luck with your move. I’m so sorry you lost your grandmother – I miss mine daily. Please take care with that lovely ring – opals are soft and crack easily ! Thanks Vicki! And I will do my best to look after it – I had heard that opals are soft but not of cracking. So I’ll take care! Hi there I recently found your summer sprigs scarf pattern and I absolutely love the way it looks. I am working with lightweight yarn for the first time and your pattern is one I’d like to begin with. However I would like to use it and make it longer to use as a shawl and I am not familiar with altering. Would you have a way of doing so? I very much appreciated you reading this. Thank you and have a great day. Hi Silvia. Glad you like this pattern! You can make it larger by crocheting a longer starting chain – just add multiples of 11 chains, until it is the width you want. Each 11 extra chains will add a pattern repeat (and a row). Or, you can modify it by adding a wider border of your choice. Good luck with your lightweight yarn! Much prayer are with you and your family. I always enjoy your postings and anytime you are able to share will be a special treat. Hopefully the coming days will bring you blessings and comfort, and more joy than sadness. Love and prayers for strength for this new life journey. So sorry to hear all your sad and bad news. Glad you’re ok and best wishes for the house hunting and moving. Take care. Praying that your 2017 is better than last. On the loss of your Nana….I know how much that hurts. But know that she will always remain with you. As you, yourself, said, your ‘creative bug’ comes from her – and she will always be with you in spirit. Sometimes you may actually feel her there with you – inspiring you – encouraging you – and yes! even making you feel warmer and so loved. That has been the case with me – and my Mom. she has left this life – and all the pain she suffered is ended, thank God! But I can actually feel her with me – almost feel her arms around me in comfort. Nana is there with you always – for as long as you want her to be with you. Wishing you the very best – though we will surely miss you…we will all look forward to seeing your before and after pictures of your new home…I know you will make it beautiful! And your Nana will be at the very least a large part of your inspiration as you make your new house into a HOME. Thank you Carol, I am glad you feel your Mom is with you. So many mixed emotions! Thanks for the encouragement. Dear Esther, I always enjoy your Posts very much and indeed wonderd what was going on. I am so sorry to hear about your sad year. Loosing someone is very hard. I wish you strength. I hope 2017 will be a great year, with a beautiful new home and lots of love and happiness. Hi Marjan, thank you for thinking of me! All the best for 2017 for you too. So much sympathy and empathy for you. 2016 wss a tricky year for me too but not involving a death of someone loved. A house move though! Still not sorted out as limited storage – so difficult!. As a dedicated house mover I would love to hear snippets now and then if you can find a few minutes to enable us to follow the journey. I love moving house. Whatever, the very best of luck and wishing you a hassle free move. Looking forward to you being back. Sorry to hear you had a difficult 2016! Ah, finding the right storage solutions can be tricky. I am expecting to have lots in the new place as it is bigger, but then there is always more (craft) stuff to accumulate… Thanks for your best wishes. Sorry to hear of your loss. I wish I knew what to say about this, I’m at a loss for words. As for your house move, good luck with that. And please, try to keep us updated on how things are going when you can (the before and after pictures you mentioned). I am so sorry to hear about the loss of your grandmother. She sounds like a lovely person and I am happy that you had such a loving relationship with her. By reading your posts for the short while that I have been aware of your postings, it is evident that she was a great influence on you and in turn, you have shared her love with us. Thank you for that. I hope that this year is better for you and your family. Thank you so much La June! So very sorry to hear of your difficult year. Although you are healing physically, emotions take so much longer to resolve. The loss of someone so dear to you will have long lasting residue. Every time you see something that reminds you of your Nana, sadness will creep in. Cherish your memories of her, know that she loved you, and enjoy the lovely ring. She would have wanted you to have something special that was hers. Healing takes time and lots of tears, but heal you will. Deepest sympathies to you and your family. We had the same kind of 2016 and still going down hill. I enjoy your site & ideas keep us posted. The things endure seem gut wrenching at the time. Never can replace a wonderful Nanna. I was just think of some verses as I sit down to enjoy a cup of tea. “Just be thankful for the good things that you’ve got. For the good things that you’ve got are for many just a dream.So be thankful for the good things that you’ve got.” These words are a great encouragement when I am burdened with a load of cares. I will be considering you in my prayers regularly, and look forward to your return with wonderful new ideas. Sorry to hear you had a bad year and start to 2017 too. Thank you for thinking of me in the midst of your own trials. I do hope things improve soon! Thank you so very much for the “charting” for this pattern. Just started this beauty. First time working with lace weight yarn. (gotta’ say it’s different)!! Was having a teensy bit of trouble with the written part, but the charting took care of that issue. I’m glad the chart helped Saundra! Thank you so much for all your contributions to creativity! I have made your summer sprigs lace scarf many times for myself and family. I really love that it is not a full triangle but more a combination of scarf and shawl. Living in the desert, I really love how light it is. I really appreciate you sharing your pattern.